Weighted pull-ups involve the usage of weights in your pull-up workout. This variation can be performed by adding weight plates to your body as a first step. This can be done by putting on a weight belt, which helps you lift the weight. To put it on, kneel down, run a chain through the weight plate and connect it to the belt. Be wary to adjust the tightness of the belt based on your own comfort level. Once done, simply start with the first set of reps on a pull-up bar. In principle, what you are doing is making your body heavier, thus putting an additional strain on your muscles. It is recommended to start with light weight plates and move up as your body adapts and builds more strength as a result of the exercise. A quick tip: feel free to hold the weight with your knees (bended) as you perform this variation. 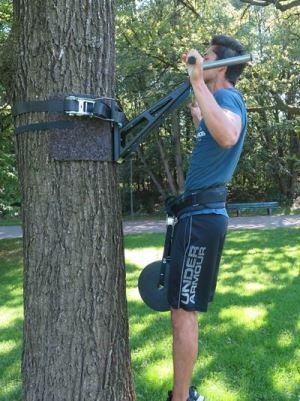 This helps to keep the weight plate(s) in one place, which can be useful if your workout becomes intense. We wrote an whole article about the benefits of weighted pull-ups. 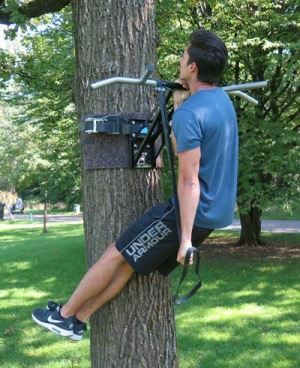 An archer pull-up is a pull-up variation that can be done without any need for additional tools or weights. To perform one, start by getting into a pull-up position. Then, using an over-hand grip, pull hard to one side and extend one arm horizontally over the bar. The key here is to pull hard in order to perform the variation properly. Thus it will require some proper training beforehand. It is recommended to do alternating sets on both arms or single sets for each arm. This variation requires swift movements in order to be performed well. Don’t be discouraged if things don’t work out right away. Essential is to train your arms first as this will greatly improve the results of the workout. (Due to the single-sided load we recommend this exercise more indoors with our indoor & outdoor pull-up and dip bar). Typewriter pull-ups involve additional movements. Similar to archer pull-ups, you use an over-hand grip and pull hard on one side and extend an arm over the pull-up bar. This variation however adds another component to this. It includes a horizontal movement to the other side. One can also start on one side, slide to the other side (or arm) and then get back down to the base position on the pull-up bar. When sliding over, do so slowly as it helps you get more out of the exercise. This variation is called the ‘Typewriter’ as it looks like the movement of a typewriter when using it. It is recommended to start with a strict (basic) pull-up form by doing 4 sets of 15 reps each. Then, progress along by building up your muscles to the point where you can perform archer pull-ups. Finally, start doing typewriter pull-ups by doing a couple of sets. (Due to the single-sided load we recommend this exercise more indoors with our multi-grip pull-up bar). The one arm pull-up is a very challenging exercise. It is most certainly not for the faint hearted! To perform this variation, grip the pull-bar with one hand only, pull your shoulder blade downwards to get in position. Then, bend your arm and pull yourself up. It helps to ‘push’ your other shoulder up to the point that you reach or pass the pull-bar. Quick tip: it is imperative to keep your other arm as close to your body as possible. Ideally place your arm alongside your body and rest your hand on your leg while doing the exercise. 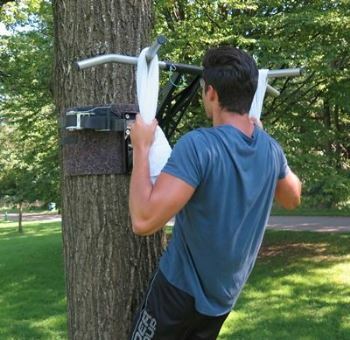 You can also use a pull-up band for support which makes the exercises much easier to practice. 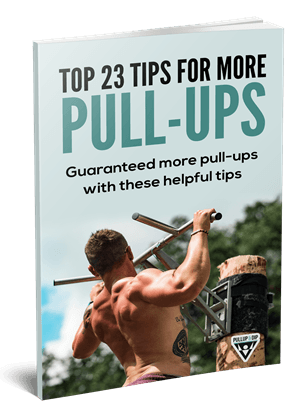 A muscle-up is a pull-up variation where you position yourself on top of the pull-up bar. The first step is to get your body in balance by swinging your body backwards whilst holding the pull-bar with both arms stretched out. Once you’ve gained enough momentum, immediately move to rest your stomach on the pull-bar. As a final step push-up on the bar and feel free to do a single dip. Quick tip, the motions involved in this variation are swift. This is needed not only to perform the exercise properly but also to avoid injury. Clapping pull-ups is a very demanding variation that involves accuracy and speed, not to mention strength. To perform a clapping pull-up, simply start by doing a regular pull-up on the bar. Once you are pull up, let go of the bar in mid air, do a handclap and grip the bar again with both hands. This needs to be done very quickly as you will most likely fall down (worst case) or lose your position on the bar. We recommend doing a set of 20 reps (or claps in this case). The L-sit pull-up involves your entire body. To perform this variation, grab the pull-bar with both arms and raise both legs up, thus making your body in the shape of an ‘L’. Then, proceed to perform your set of pull-ups by holding this position. The key is to pull yourself up in this position until your chin has passed the bar. 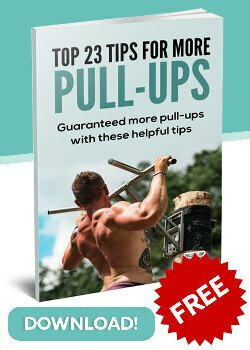 It can be a demanding pull-up variation for some, as one needs to concentrate on both your arms and legs. Quick tip: your hands should be in shoulder width of each other. When completing a rep, feel free to extend your arms fully (base position) on the pull-bar. Doing pull-ups on their own can be fun. Even more so is doing pull-ups using a towel. Simply grab a towel, throw it over the pull-bar, grab both ends with your arms and start doing you regular pull-up set. Towel pull-ups can differ in styles though. For example, you can perform regular pull-ups using a towel but also the L-sit pull-up variation we just discussed. 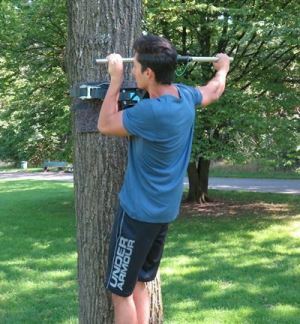 Remember the article we wrote on pull-up grip strength? This pull-up variation seriously improves your grip whilst making the regular pull-up much harder to perform. Doing around the world pull-ups is a fun variation to start off with. To perform one of these, simply get into the base position for doing a pull-up (arms stretched out) and perform a rotating movement from one arm to the other back down to the base position. It resembles the typewriter pull-ups we discussed above with the main difference being the rotation. This is done much quicker. Quick tip: do a full rotation and follow-up with a reverse rotation. 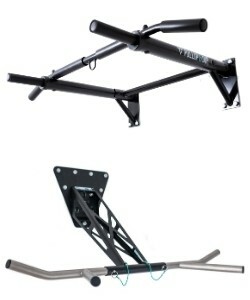 These can be considered as two reps.
A kipping pull-up resembles a regular pull-up. 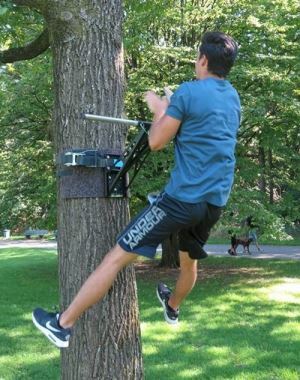 It simply adds a swinging motion to the exercise. To perform a kipping pull-up, start by extending your arms on the pull-bar. This requires a full handgrip with your hands being just outside should width from each other. Initiate the exercise by swinging your body using your shoulders. You can choose or alternative between hollow and arched body forms. To complete a rep, pull down on the bar in order to pull the body up to the point where your chin has passed the bar. Then, get back down by pushing away from the bar. Quick tip: this exercise requires a constant flow of swift movements. All parts of the exercise need to be performed in unison, as it will not result in a success if performed poorly. The first 5 I knew already, the others like towel pull ups or clapping pull ups I didn't know yet and will definitely test them out. 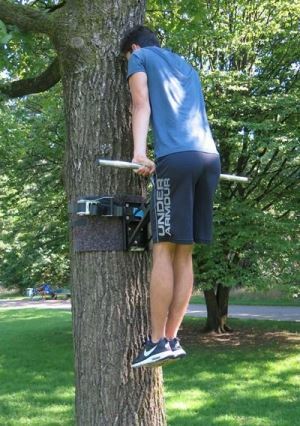 I can imagine the clapping pull ups are quite tough, do you also recommend them on the Pullup & Dip bar?